Rich Rod, in happier days. The University of Arizona fired football coach Rich Rodriguez Tuesday, according to a UA press release. No exact reason was given for the school’s decision, though the university will honor the separation terms of Rodriguez’s contract, which include a $10.2 million buyout, according to USA Today. Director of Athletics Dave Heeke cited the school’s investigation into allegations of sexual harassment against Rodriguez, which began in October. That investigation, according to Heeke, did not find that Rodriguez posed any danger to members of the community, though the alleged victim chose to pursue further litigation. “As a result, we have been reviewing the findings and deliberating our course of action. While this is a difficult decision, it is the right decision. And it is a decision that lives up to the core values of the University of Arizona,” Heeke said. 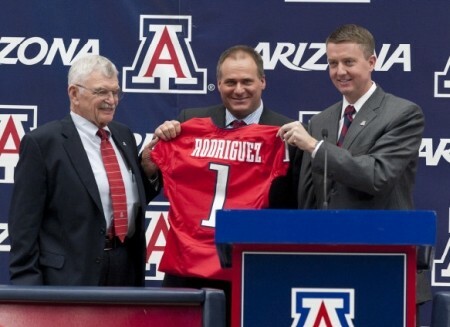 Update: Rodriguez took to Twitter Tuesday to release a statement regarding the UA's investigation. He discussed a complaint by a former administrative assistant, who threatened to file a $7.5 million lawsuit alleging harassment. Rodriguez said he cooperated with the 10-week-long investigation, taking a voluntary polygraph test, which he passed. He admitted to have an extramarital affair with a woman not affiliated with the university and expressed regret for his conduct. "It was wrong, and I have apologized to my wife and family. I am still working incredibly hard to repair the bonds I've broken and regain the trust of my wife and children, whom i love dearly," Rodriguez said. Rodriguez thanked his staff and players for their commitment and effort during his tenure, and vowed to fight against the claims made against him going forward. There is no timetable for naming Rodriguez’s replacement, though the National Signing Day for high school players is Feb. 7.